Is Your City Prepared To Evacuate? #Infographic ~ Visualistan '+g+"
Nobody every thinks that they will ever have to evacuate their home or city. The only time it crosses our mind if is we are forced to evacuate because of some sort of disaster. Evacuations happen more frequently that you might think especially with hurricane and flooding season hitting the United States. Would most people or even cities for that matter be prepared when it came time to evacuate? 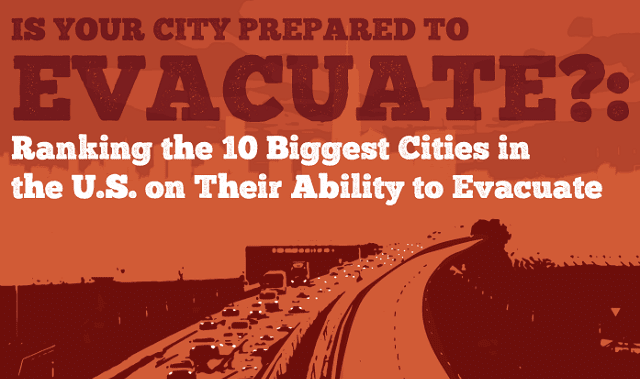 The forensic consulting experts at PT&amp;C LWG compiled a list that ranked the 10 biggest cities in the United States on their ability to evacuate. The goal here was to see just how capable every major metropolitan city in the United States would be in handling an evacuation of their city. They took into account everything from highways.org studies, geographic barriers and data related to exit capacity, internal traffic scores, population density, access to public transportation and many other factors. To learn more about how each city is ranked, check out the infographic below.